Its a very peaceful mooring at Calder Grove. The Navigation Inn is just a short walk down the canal but I had a night off from checking out the local pubs :-) Dash had come ashore to see what I was up to. 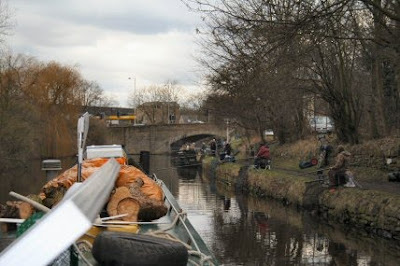 In fact I was doing my bit at the lock clearing the rubbish that flows down and gets behind the gates. The large railway bridge that I thought we would be going under can be seen here. The bridge in question I now think is actually over the River Don further on from Doncaster towards Sheffield. 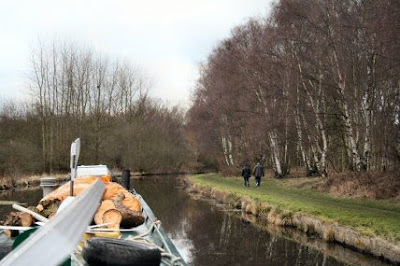 I set up the locks to leave at 1200 and as I walked back to the boat I saw another narrowboat coming our way. We let them go first and nb Success seemed pleased enough to be locked through without getting of the boat. Much of this area is very rural and there are plenty of walkers, cyclists and runners about. Now and again the passersby close the gates for us to save mooring up for a second time. Many of the locks have the old handspike paddles. Luckily many of them also have the usual winding gear for the paddles. The locks are getting a little on the short side but we manage to get two boats in together so far. 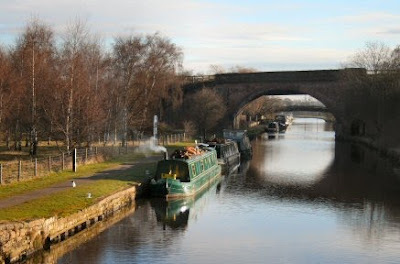 We were going to moor for the night at Horbury Bridge. Its claim to fame is that Onward Christian Soldiers was written here as a marching song for children. However there seems to be an angling contest going on. Tim gets along side but I thought that rather than annoy the anglers by making them move I decided it was politic to carry on for a while. Close to the bridge there are a number of warehouse businesses and one of them sells flooring. I will call here on the way back to pick up something to cover the the living area in the boat. The carpet is not very practical. Now and again I need to be inside in a hurry and its impossible to keep it clean. Wood is the thing I think. The Figure of Three locks get their name - it is said - from the fact that the river nearby makes three turns that look like the figure 3. If that is the case I would have thought that there would be an awful lot more with the river forever meandering its way down. 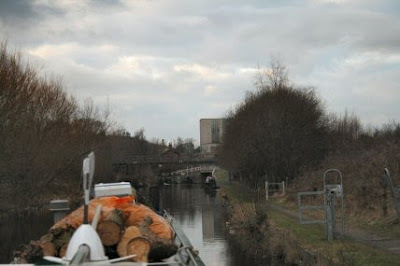 When we arrived the Scouts narrowboat - Be Prepared - was coming down with a trainee at the helm. 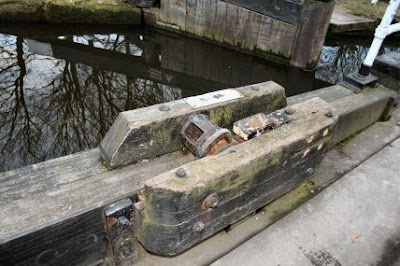 The locks are paired with a pound in-between and this will allow two lots of boats to use it at the same time and pass in the middle. We have started to find large rafts of weed covering the canal from side to side. I will have to check the weed hatch at some stage. A burst of astern has cleared the weed from the rudder area so far. 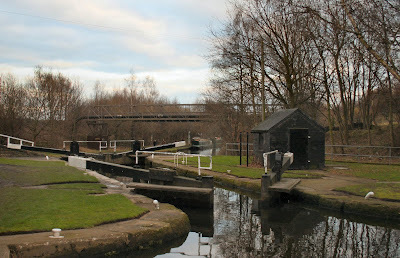 Mill Bank Lock is the first that I had problems with. A 60 foot boat has some trouble going into a 59 foot lock. This meant that I had to go in solo and with the bows in the centre of the top gates and swing the stern behind the lower gates. There wasn't room to get a second boat in. A lot of care needs to be taken with a number of these locks. With the sluice being in the gates if one is not mindful the open sluice dumps the water straight into the bows. A number of boats have been sunk by this over the years. The lock gates are old and heavy with the winders taking a bit of effort to wind the sluices up. Pressure of water creates enough friction to make it hard work. 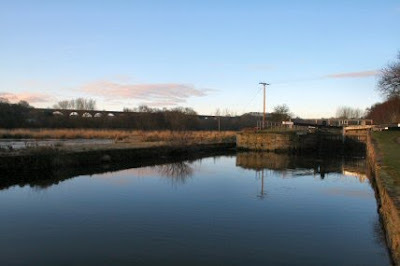 The end of the line for us tonight is the Dewsbury Arm which is under the concrete bridge on the right. 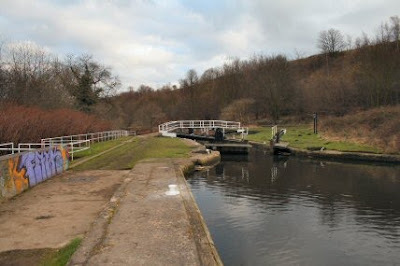 Huddersfield is through another pair of locks to the left. As soon as I was moored I took a look at the lock to see if it was going to be another solo locking. It might fit but we will have to wait and see.